Yardney Technical joins a crowded field, as suppliers, some of which have banded together, race to design Li-ion batteries that will satisfy the rigors of an automotive application. A Connecticut-based supplier’s lithium-ion batteries have just marked their fifth year powering 6-wheel-drive vehicles that have endured -40° F (-40° C) temperatures and withering dust storms over more than 72 million miles (108 million km), combined. The vehicles didn’t accumulate that mileage on their own. Their odometer readings largely are attributable to the NASA rocket that helped transport them to their proving grounds – on Mars. 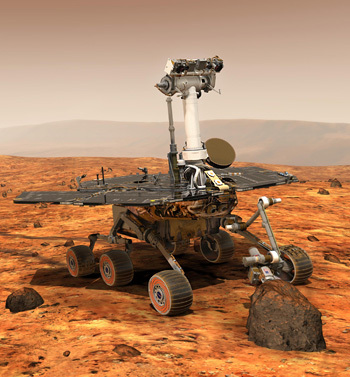 Yardney Technical Products Inc.’s Lithion-brand Li-ion batteries power two Mars Exploration Rovers (MERS). Having conquered the final frontier, Yardney now is turning its attention to automotive applications. “We’ve got a good track record,” says engineer Bill Yalen. Indeed, each of the Mars vehicles, which are about the size of lawn tractors, is powered by a pair of 28-volt Li-ion batteries. These are recharged via banks of photovoltaic cells that adorn the vehicles like peacock feathers. Dubbed Spirit and Opportunity, the remote-operated MERs were designed to last a minimum of 90 days on the red planet – just long enough to assist with some scientific experiments. Five years later, they’re still cruising along, albeit at a pace dictated by caution and the vehicles’ total cost of $820 million. Since landing on Mars, the MERs have traveled about eight miles (13 km). But Yalen is adamant about the potential of Li-ion. “The technology is there,” he says, adding Yardney has several ongoing research projects designed to resolve shortcomings such as energy density, longevity and charge cycles. Cost is the biggest roadblock, not the science, Yalen says. “The lithium-ion business is obviously focused on small-scale personal products – laptops, cell phones, PDAs, iPods, things like that. When you start scaling up to long-range vehicles, lithium-ion starts to be expensive. But I don’t think it has to be prohibitively expensive. “If the will is there and funding is there, a product can be fielded,” he adds. Yardney joins a crowded field as suppliers, some of which have banded together, race to design Li-ion batteries that will satisfy the rigors of an automotive application. Massachusetts-based A123 Systems Inc. reportedly applied this week for government loans to fund construction of a Li-ion battery manufacturing plant in southeast Michigan. Pared with Continental AG of Germany, A123 is competing to win the supply contract for General Motors Corp.’s Chevrolet Volt extended-range electric car, scheduled for production in November 2010. Some 14 other U.S. companies have formed the National Alliance for Advanced Transportation Battery Cell Manufacture. Members include Johnson Controls-Saft Advacned Power Solutions, a joint venture of Johnson Controls Inc. and France’s Saft Groupe SA, along with 3M Co. and Eagle Picher Industries Inc.
Additional research muscle is being supplied by the Argonne National Laboratory. Against this backdrop, Asia is believed to be at the forefront of Li-ion battery development, as companies such as LG Chemical Ltd., Sony Corp. and Sanyo Electric Co. Ltd. seek to win contracts with a growing assortment of auto makers planning to introduce vehicles that rely more on electricity than gasoline. In addition to GM, Toyota Motor Corp., Chrysler LLC, Mitsubishi Motors Corp., Nissan Motor Co. Ltd. and Hyundai Motor Co. Ltd. plan such offerings within the next few years. In that case, charge times must be reduced below the 3-hour minimum requirement GM estimates for the Volt. Yalen envisions, perhaps, a Starbucks outlet with charging stations, so motorists can fill up on coffee while their vehicles are getting juiced. “There’s a lot of cross-marketing opportunities,” he says.